Learn all about the starting times, eligibility, platforms, and what's being tested. In our story about the lessons learned from the first Closed Alpha, we promised that there would be more opportunities for select players to get an early hands-on with Battlefield™ V before the October launch. Today, we're telling players all they need to know about Battlefield V Closed Alpha 2, set to start on August 14 and run for a limited time. This is a short play test and we will need as many invited players as possible to act fast and jump into our Closed Alpha servers in order to make it successful! 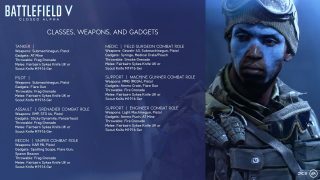 Note that game content, gameplay mechanics, and other Battlefield V aspects covered in this article may change between the Closed Alpha and the game's launch. 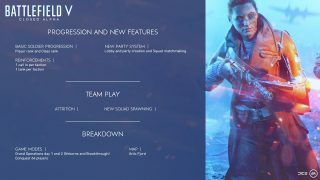 Is the Closed Alpha the Same as the First Closed Alpha Build of Battlefield V? The second Closed Alpha is built directly from the first Closed Alpha and it will not contain any new content like maps, modes, weapons, and vehicles. However, there are a few important changes we want to evaluate with you. The focus of this test is player progression speed. We have made some changes that we think will better cater to players across all play styles and skill levels based on how fast players scored points, and how quickly they progressed through the ranks in the first Closed Alpha. We’ve also made improvements to matchmaking and fixed issues related to joining squads. Additionally, we have also tuned the weapon balancing. 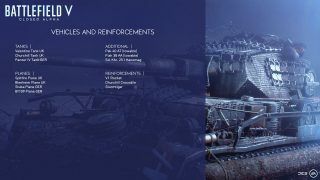 To find out more in-depth details about the changes please visit: https://forums.battlefield.com/en-us/discussion/150277/battlefield-v-closed-alpha-2-starting-on-the-14th-of-august. Gameplay aspects such as map, weapon, and vehicle balance are still being tested so that we can make sure matches are fun, fair, and reward skilled players. We are also assessing our new systems, like attrition and soldier movement, to find that gameplay sweet spot. On the technical side, we’re assessing Battlefield V in a live environment. Think, server stability, backend connectivity, and matchmaking. On the heels of last month’s Closed Alpha and the lessons learned therein, it will be another opportunity for us to stress-test servers and improve several aspects of the game, thanks to the participation and feedback from those taking part. Each test and the resulting feedback will help ensure Battlefield V stability, balance, and more as we work our way towards the October launch. And while this is certainly a test of the game, the Closed Alpha is as much, if not more, about giving players a fun hands-on experience with Battlefield V.
We’ve read and acted on much of the feedback that we received during the first Closed Alpha. You’ll get a better glimpse of those changes during our Open Beta period, but for Closed Alpha 2, we would like you to focus on the matchmaking, squad joining functionality, as well as simply playing as you normally would, so that we can evaluate our tweaked leveling curves. Europe: Austria, Belgium, Bulgaria, Switzerland, Cyprus, Czech Republic, Germany, Denmark, Estonia, Finland, France, Great Britain, Georgia, Greece, Croatia, Hungary, Ireland, Isle of Man, Iceland, Italy, Liechtenstein, Lithuania, Luxembourg, Latvia, Moldova, Montenegro, Macedonia, Malta, Netherlands, Norway, Poland, Portugal, Romania, Serbia, Sweden, Slovenia, Svalbard & Jan Mayen, Slovakia, Spain, San Marino, Turkey. Invitations with codes for the Closed Alpha will soon be sent to a small group of Battlefield players. These codes can be redeemed in the Origin client. Players that have a valid Battlefield V Closed Alpha entitlement from the first Closed Alpha on Origin are automatically invited back into the Closed Alpha 2. Just reinstall it when it becomes available in the Origin client. Those that have already redeemed their codes will indeed get an email with the same code, just in case. Codes that have not been redeemed yet can also be used to access the Closed Alpha 2. Additionally, we will be sending out more invites through email to give even more players the chance to try Battlefield V.
The Closed Alpha will begin on August 14 and will be available for a limited time only. 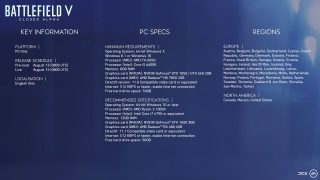 Please note that these specifications are for the Closed Alpha and not necessarily for the final game. What Modes and Maps will the Closed Alpha Contain? Conquest mode or the Grand Operation Fall of Norway. Taking place on the map Arctic Fjord, Fall of Norway lets you experience two of its in-game “days” and play two of the modes that the Grand Operation strings together: Airborne and Breakthrough. When playing Airborne, you’ll either paradrop down to the battlefield to deal with enemy artillery, or counterattack if you’re on the opposite team. In the frantic fights of Breakthrough, you must capture sectors as an attacker or keep the opposition at bay through on-the-fly planning. As for Conquest – this is the timeless Battlefield classic where two teams use infantry and vehicular combat to seize a majority control of key control points. Are There In-Game Challenges and Rewards? No, the second Closed Alpha will not have any Special Assignment or Daily Orders, as this time we are focused more on testing gameplay fixes. Absolutely! Participants are free to share footage of their Closed Alpha sessions, as there are no non-disclosure agreements in place. We're excited to see the content you create and to hear your constructive feedback, so make sure to tag our official Battlefield channels when your content is live. (Please note that this URL will only work once the Alpha is up and running). For our console players, we also want to hear what you think of the Closed Alpha. As there is no embargo in place for captured/streamed content for Closed Alpha #2, please keep an eye on gameplay videos and streams that will likely show up shortly once the Closed Alpha has been launched. Let us know if you have any feedback for us. Remember that this is a short but critical play test and will need as many invited players as possible to flood our Closed Alpha servers in order to make it successful. Enter mankind’s greatest conflict on Xbox One, PlayStation®4, and PC. On October 11, play the full game with Origin Access Premier or try it as part of the EA Access and Origin Access Play First Trials**. 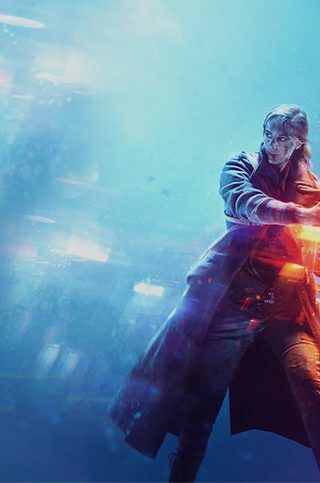 Or, join the fight on October 16 with Battlefield™ V Deluxe Edition early enlister access, or October 19 with the Battlefield™ V Standard Edition***.